Impressive as they may be, Photoshop tricks are a little bit trite. But what if those same sorts of mind-bending manipulations came to life in 3D, allowing you to change the story of a photograph? Well, a new photo editing tool from some of the nation's top computer scientists lets you do just that. The best part is, you can try it out for free. The effect is actually pretty incredible. While it takes a little bit of work to adjust the 3D model so that its dimensions match up with the object in the photograph, the examples shown by the researchers are pretty impressive. 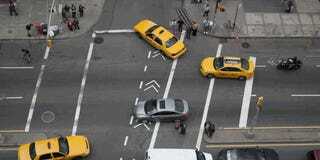 Have you ever seen a taxi cab do a loop-de-loo like that? Of course, you have to remember that the possibilities of the software as the researchers present it are somewhat limited by the availability of stock 3D models, but a quick Google search reveals plenty of options. If you're interested in the computer science behind the software, you might enjoy the paper the researchers just published which goes into extraordinary detail. There is no shortage of challenging-looking formulas in play.